The Theory of Everything — a look at the 26-year marriage between physicist Stephen Hawking and Jane Wilde — is based on Wilde’s book, Travelling to Infinity: My Life with Stephen. I begin there because those expecting a movie along the lines of Errol Morris’ A Brief History of Time or a visual companion piece to any of Hawking’s many bestsellers, probably will be disappointed. Although the movie has taken the title of one of Hawking’s books, it has less to do with theoretical physics than with a very untheoretical marriage that lasted quite a long time. Wilde knew that Hawking had contracted ALS (Lou Gehrig’s disease) before she insisted on tying the knot. When Wilde married Hawking in the 1960s, he had been given only a few years to live. He’s now 72. Director James Marsh (Man on Wire) makes a choice that opens his movie to a wider audience than those obsessed with cosmology. Perhaps Marsh assumed, quite justifiably, that those who are deeply interested in questions such as whether time had a beginning would know where to look for more information. Hawking, by the way, changed his mind about that question during the course of his work. Admittedly, The Theory of Everything might have been more interesting if Marsh had given us a bit more insight into Hawking’s work, but the movie earns its stripes as an intriguing look at a difficult marriage, and it makes no attempt to canonize either Hawking or Wilde. 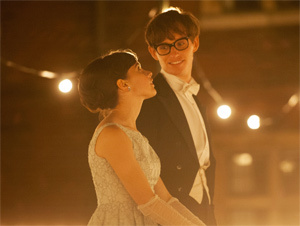 They remain human beings dealing with adversity, and if you bypass The Theory of Everything, you’ll miss two of the year’s finest performances: from Eddie Redmayne as Hawking and Felicity Jones as his wife. We meet Hawking at Cambridge in 1963. He’s the kind of annoyingly bright graduate student who easily impresses his professor (David Thewlis) by breezing through problems that drive other students crazy. Redmayne gives a physically demanding performance that must have become more taxing the more he was called upon to mimic the disease that deformed Hawking’s body, put him in a wheel chair and eventually took his voice. Hawking speaks with a computer-generated voice that, by now, has become familiar to those who’ve seen him — and who hasn’t? Redmayne not only captures Hawking’s physical disabilities, he infuses his performance with intelligence and wit. A half-smile that may result from disease also serves as a kind of metaphor for a situation in which Hawking seems to realize that biology has dealt him an absurd hand. Jones’ performance is every bit as good. When we meet her, she’s a young woman studying medieval Spanish literature. Unlike Hawking, she believes in God. It’s almost as if she intends to will her marriage to succeed. As the story unfolds, Jane’s decency never wavers, but she also begins to feel the inevitable resentments of a woman whose sacrifices have been doubled: She’s a caretaker both for Hawking and for their three children. Unlike most of us who are prone to complaint, Jane has earned her frustration. When Jane joins a church choir, she meets choir master Jonathan (Charlie Cox), an incredibly understanding fellow who becomes part of the Hawking family. Increasingly, he provides Jane with much needed emotional support and, ultimately, with love. Marsh takes a non-judgmental approach to both Hawking and Jane, allowing them to be themselves without the intervention of an authorial voice to tell us where they’re doing well and where they may have gone wrong. So, yes, I’d have preferred a little more science and a good deal more stylistic daring to match the boldness of Hawking’s thought, but The Theory of Everything deserves credit for taking a mature look at the evolution of a most unusual marriage between two most unusual people. And the mysteries of marriage, as even the dimmest of us must know, remain resistant to scientific analysis.